The late FIA GT series, which ran “homologation specials” that were basically just prototypes. For the past few months, the top hypercar manufacturers and the FIA have been in talks to decide what the top class of sports car racing will look like at the 24 Hours of Le Mans and beyond. Their conclusion is to have a new level of freedom for hypercar design for LMP1 prototypes. Another shot of the 1997 FIA GT series, with a longtail McLaren F1 getting loose at Laguna Seca. Why post this? Wouldn’t you? This is not a bad thing. For years now, prototypes have struggled to look anything like, you know, cars. Today’s top LMP1 contenders look like indistinguishable insectoid streamliners, not like any one manufacturer’s cars. In the last year of Porsche vs Toyota, for instance, both cars looked and sounded nearly identical, even down to the paint jobs. Everyone knew that something needed to be done or LMP1 would price itself out of existence, and that something was... oddly ambiguous. It seemed like there were two paths: either today’s crop of superfast road-going hypercars would be all lumped into one racing class for competition, or a new batch of pure prototypes would be commissioned that had road car looks alone. Targeted budget of one quarter of current LMP1 budgets. Freedom of design for brands based on a ‘Hypercar’ concept. The FIA also said it’s working to promote more female drivers and it will tell us more a week before Le Mans, which is next weekend. That’s all. 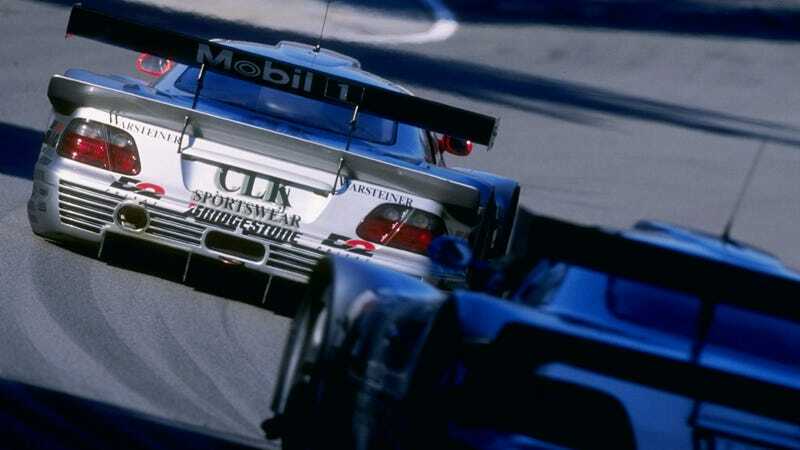 There is no mention of homologation specials that made GT1 so great in the 1990s. Is “freedom of design” a question of engineering or is it styling alone? Unclear. Worse still, we’ve got some ambiguity from the car companies themselves. At the table in these discussions were Toyota, McLaren, Aston Martin, Ferrari and Ford, as Motorsport.com reports. The most recent of those companies to show off a hypercar was Toyota’s racing Team Gazoo, which showed the GR Super Sport Concept at the start of this year. It’s basically a 1,000 horsepower prototype, pure and simple. But Toyota says it would be road legal. What I really care about is if these vehicles will be seen outside Monaco cafes just as often as on the Circuit de la Sarthe. There’s no clear answer for that yet. Jalopnik has reached out to manufacturers involved in these discussions for clarification, and will update if we get anything back. The rules, which have the working title of ‘GTP’, will allow for manufacturers to give their prototype machinery the look of one of their road-going sportscars. The intent of the new rulebook will be to maintain the current level of performance, but at a substantially reduced cost. Now, were the final days of GT1 really that different? Not really. The final “homologation special” cars were barely actually produced if at all and were mostly just prototypes in road car suits anyway. But they felt so much more real than, say, the first Peugeot 905s, which were pure prototypes but with road car-looking headlights on them. The early Peugeot 905. Nice V10. The current run of LMP1 was a super expensive moonshot, as technically complex as Formula 1. The problem Gwas it was without F1's media reach, the same sort of problem that killed Group C back in the 1990s. So altogether, this is not a bad thing, and I do hope we find that there will be road car spawn to link this all together.